Much of the following also applied to watermills. Windmills have had to develop and an important part of their income is derived from visitors who can see mills in operation. 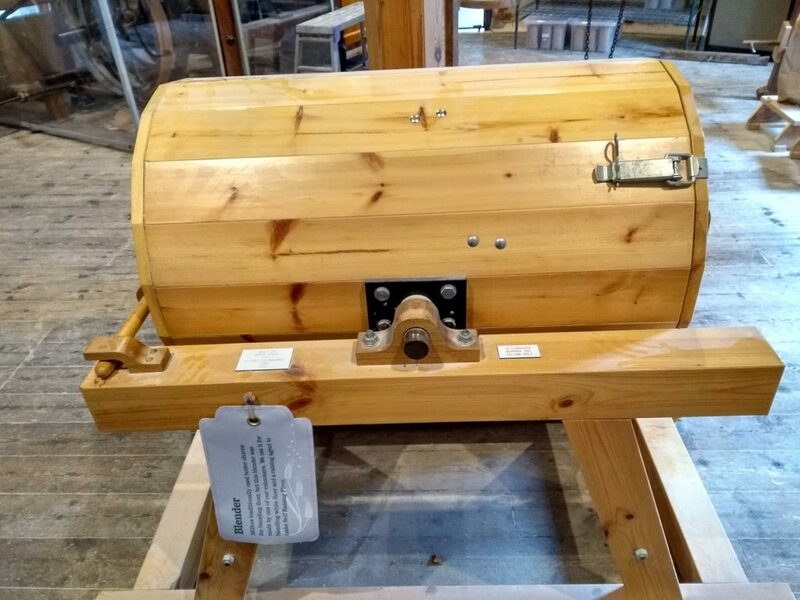 See the mill stones in action on a YouTube video clip by our Research Team, video link also on the Windmill Development page. The Lord of the Manor would build a windmill and employ a miller (or lease it to a miller). A condition of renting a farm from the lord’s estate would require the tenant farmers to use the estate’s windmill. The fees for using the estate windmill would be higher than those for using independent windmills. The miller did well and the Lord of the Manor even better. A group of farmers would subscribe to meet the cost of building a windmill. They would employ a miller (or lease it to a miller). The difference from an estate windmill is that the farmers were in control. Milling fees were lower or if high the subscribing farmers shared the profits. Where millers worked their windmills in competition with other windmills, unless they operated a local cartel, the necessities of competition kept fees low. 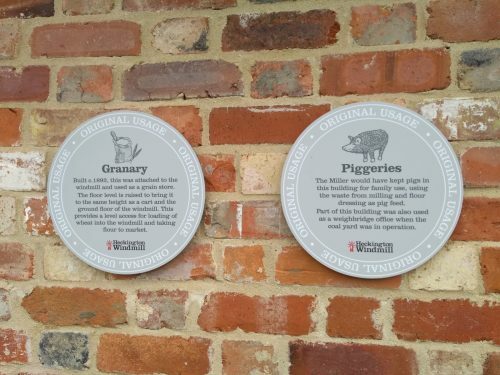 As an example during the 1850’s and 1860’s the Griffins at Hough Mill would have been competing with Thomas Kirby on the other side of St George’s Hill, plus the watermill not far from the George and Dragon inn at Thringstone. Each grain of wheat, barley etc is protected by the hard coat of its husk. Grain can thus be stored for a long time and used gradually during the year. The old testament story of Joseph in Egypt describes filling granaries during seven years of good harvests, then releasing the grain during seven years of bad harvests. Flour has a much shorter shelf life. Shorn of its protective husk it is much more susceptible to moisture, mould and other threats. This was especially the case before modern day air tight containers. As a result, grains were milled into flour throughout the year. Maud Foster Windmill in Boston was built with a large granary. The owner could thus buy and store lots of grain at harvest time when the price was low. The grain would be milled throughout the year and the flour could be sold at the higher prices that occurred before the next harvest. Grain merchant millers were this the richest millers. 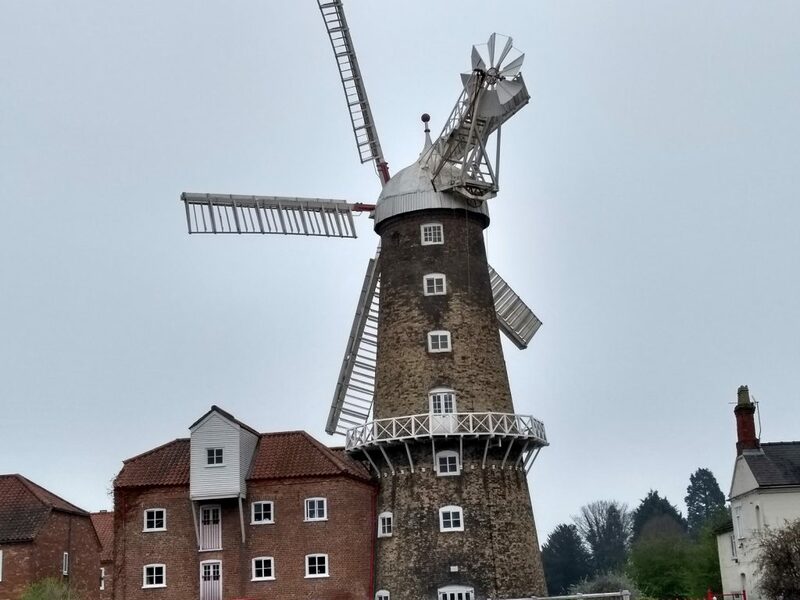 Maud Foster Windmill, Boston Lincolnshire had a large granary. From the 1880’s steam roller mills increasingly dominated the market. Coal fired boilers powered the steam driven rollers that could operate night and day. They did not have to wait for the wind, nor worry about dry summers reducing the flow of water needed to power a watermill. Areas such as North West Leicestershire were particularly susceptible. Cheap coal was freely available and there were extensive links to take the flour to market throughout the UK. 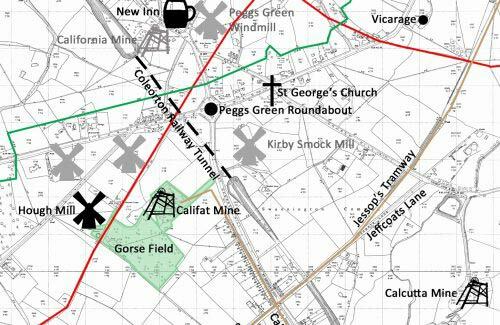 Windmills continued their operations longest in remote, rural areas such as Lincolnshire and Norfolk where many villages were a considerable distance from the railway network. The owners of steam roller mills would often buy nearby windmills and watermills. What they wanted was the grain contracts, as they needed huge quantities of grain. 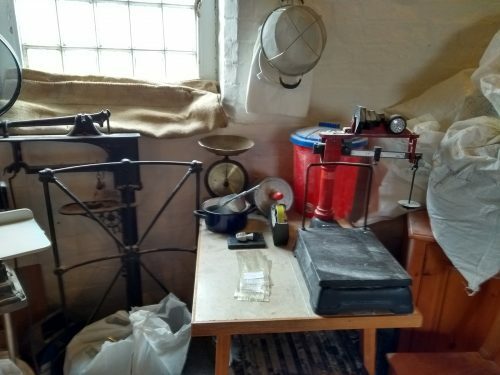 They would smash the milling equipment to prevent the mill from reopening, then sell on the mill and its associated buildings such as the house. 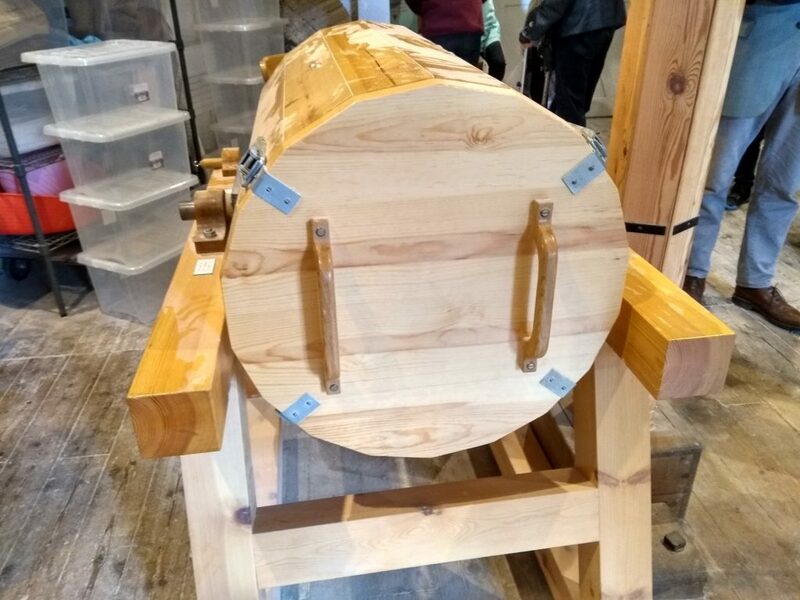 Millers weighed the sacks of grain as they came into the mill or granary. Likewise the sacks of flour were also weighed. The flour sacks would weigh slightly less than the grain sacks. Grain always has an element of moisture. In former times the miller would use his judgement on whether the moisture content was acceptable. Grains would be rejected if too moist as this clogged the milling machinery. Sibsey Trader Windmill estimate that 1-2% of the grain weight would be lost to evaporation. If you visit a working windmill there will be lots of flour dust on some of the floors. 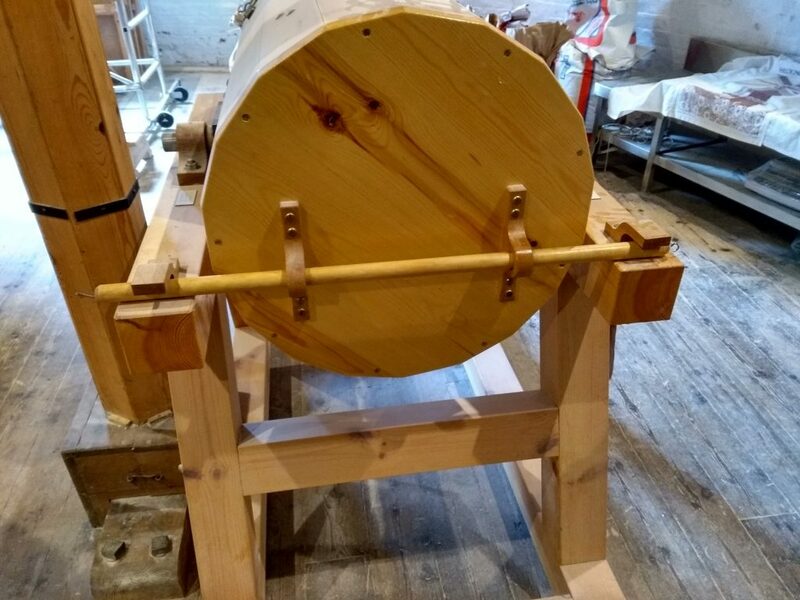 Despite the wooden tun around the stones flour dust escapes. 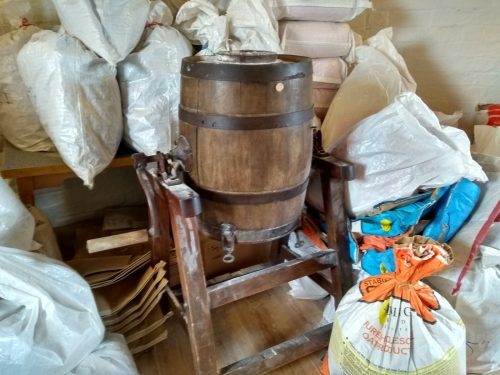 Likewise flour dust escapes from the flour dressing process, where the wholemeal flour is sieved into white flour, other grades of flour such as semolina, plus the bran. The total loss could thus be 3-4%. Some millers received cash payments and the flour did not go out of the door until the money was paid. At Dobson’s Windmill in Burgh Le Marsh, near Skegness, Lincolnshire a safe is built into the wall. There is a slit in the top to drop the money in. The safe had two locks on the door. The key to one lock was held by the owner and the key to the second lock by the miller. They both had to be present to remove the money. At other mills the miller was paid in flour. He would keep back a set proportion. There were often complaints that millers retained too large a miller’s share. The mill house was usually right next to the windmill. The miller would thus be on hand to deal with any issues. Hough Mill is unusual in that the miller lived a couple of hundred yards or so (200 metres) from the mill. A possibility is that records refer to a post mill to the east of Hough Mill. 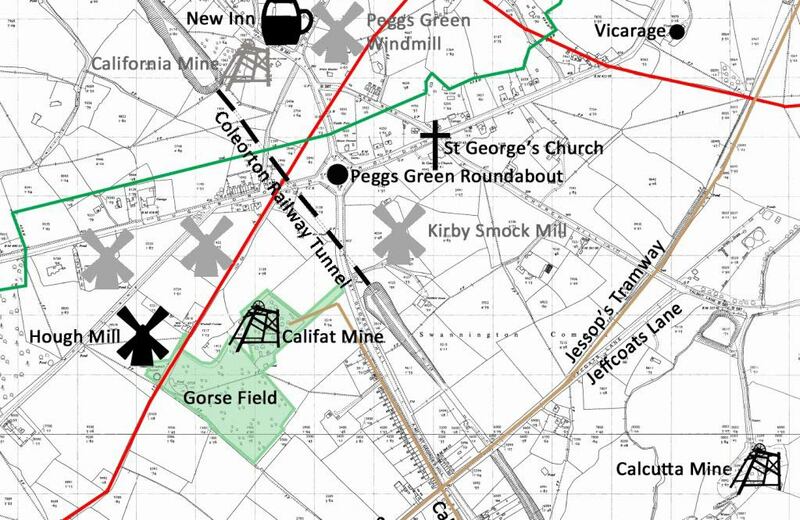 So the mill house could have been close to the post mill, which pre-dated the tower mill. If a storm arose the miller would check that the brake on the brakewheel was still effective. If the wind was too powerful, the miller would release the brake and work the mill. Allowing the sails to freewheel could cause damage. By working the mill the weight of the stones and other milling equipment placed a drag upon the sails which reduced the likelihood of damage. Many mills had a granary to store grain and flour. The waste from the mill, the bran, would be fed to the pigs. Another way the miller could profit from milling. Some windmills had a bakehouse, one example being Stembridge Mill in Somerset. Heckington Windmill, Lincolnshire had a granary and piggery. Dobsons Windmill, Lincolnshire, had a large gallery above the cow sheds. 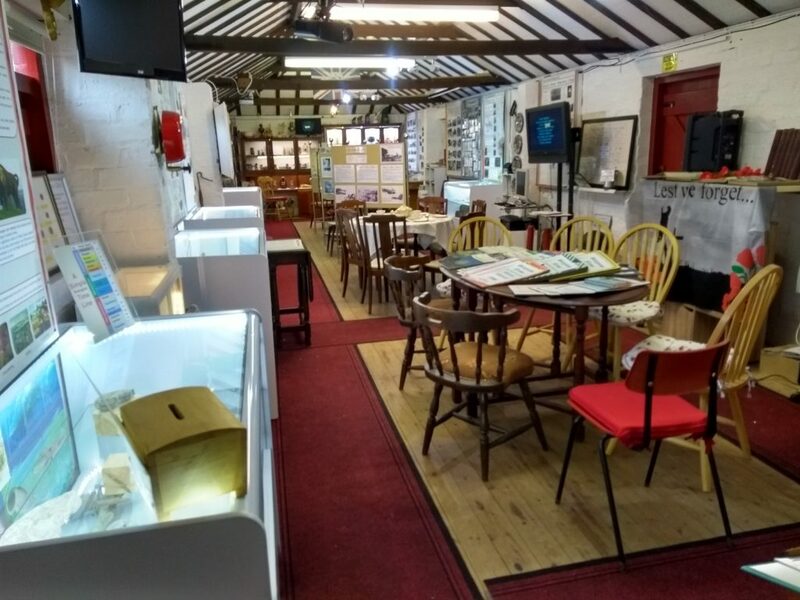 It is now their history room. 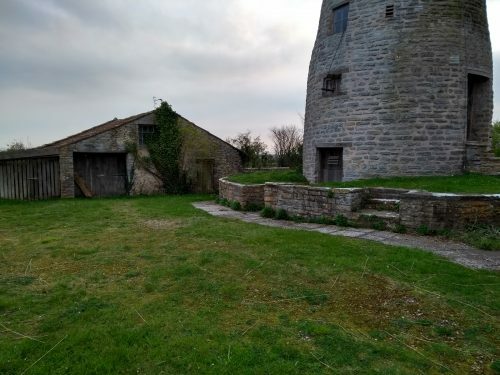 The bakehouse next to Stembridge Windmill, Somerset. Maud Foster Windmill sells a range of flours and oats to visitors and specialist bakeries. Sibsey Trader Windmill may have lost its sails but it keeps trading. An arrangement has been made with another windmill for the Sibsey miller to use a set of their stones and flour dresser. 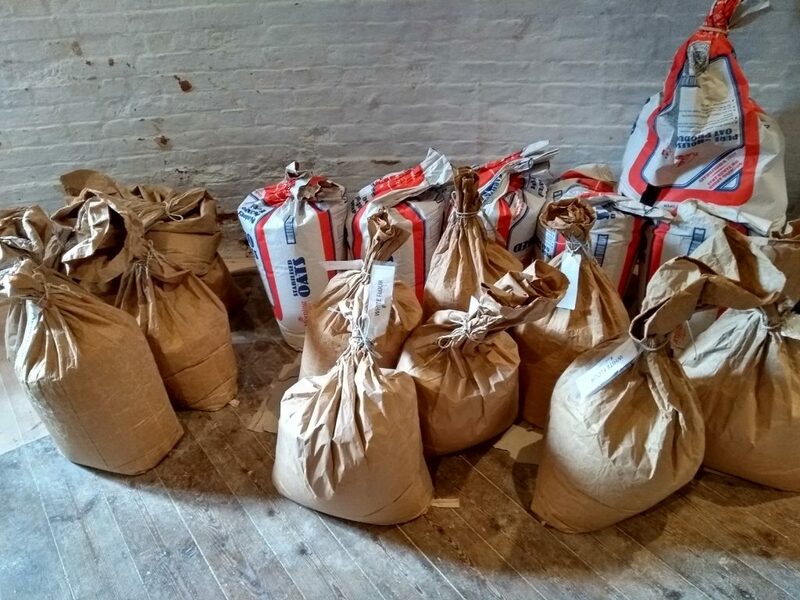 The flour is then transported to Sibsey where it is blended, bagged and sold under their “Six Sails Mill” brand. Sibsey have a former butter churn blender. Heckington have recently made their own blender. They tested it with 25 kilograms of flour plus gravy granules. The reason for using gravy granules? They wanted to test how many turns it took to properly mix two components. If they had used two varieties of flour or flour and bicarbonate of soda to make self raising flour, they would not have been able to tell how well mixed they were. A brown substance such as gravy powder made it easy to confirm that they were fully mixed. Must have been an interesting flavour of bread and cakes! Flour blender at Heckington Windmill, four clips keep the top in place. Flour blender at Heckington Windmill, inside the metal strips ensure the flour mixes. 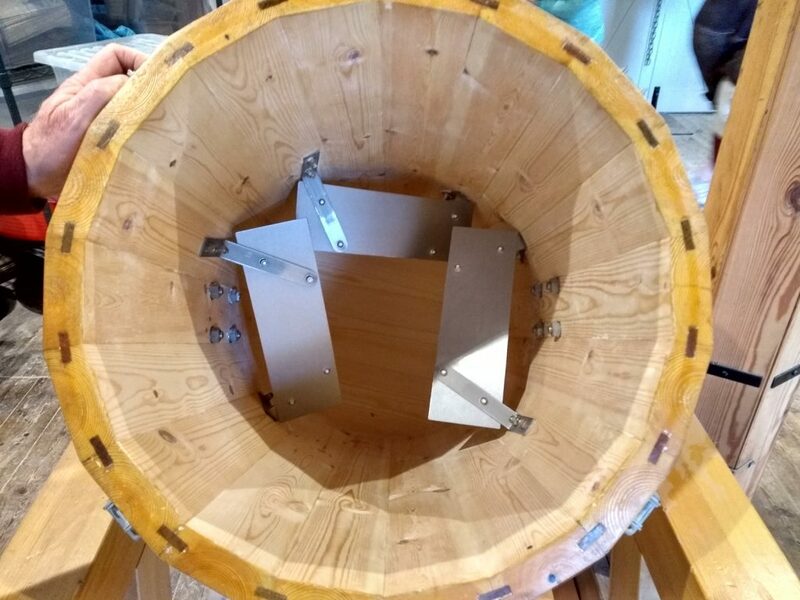 The bar is removed when the flour blender is used.